The United Airlines jumbo jet was on the ground at Chicago's O'Hare International Airport after a flight from Hong Kong, looking as bedraggled as you would imagine, having been inhabited for 13 hours by hundreds of people crammed into close quarters. Cleaning crews were on the job, but Paul Sanders leaned into a freshly sanitized lavatory, sniffing loudly, his head tilted back for full nasal intake. Beneath a blast of floral-scented disinfectant, he picked up a faint foul odor. "I'm just not pleased with this bathroom," declared Sanders, eyeing the seemingly spotless lavatory. "Lucy! Lucy!" he bellowed to the supervisor in charge. If only it had always been this way for the airline industry: a fastidious United manager like Sanders, nicknamed Mr. Clean, charged with ensuring that the glamour of flying was regularly scrubbed and spritzed back into the fleet. For much of this decade, that had not been the case. Along with flight delays, passengers trapped onboard U.S. airlines were forced to sit amid other people's filth: crumbs, coffee stains, dirty Kleenex in seat back pockets and often far worse detritus in bathrooms as carriers skimped on cleaning to save money. But airlines now are cleaning up their act and their planes as passengers travel less and become more sought-after customers due to the recession, finally acknowledging gaping service shortfalls that have made flying in the U.S. such a misery in recent years. Among them, United Airlines is starting to pay greater attention to its planes, after scoring last in a J.D. 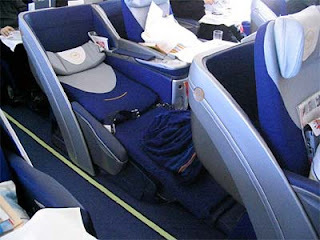 Power and Associates survey of airline customer service in 2008 and tying with Northwest Airlines for the lowest consumer ranking of its aircraft interiors. Starting last fall at Chicago's O'Hare, United overhauled both how it tackles dirt and stains on its jets and how often it does so, a process it has since rolled out to 13 other cities. United used to let each of its airports determine how planes would be cleaned. Now, headquarters sets the tone and the standards, using a process that is broken into simple steps with clear goals that crews can follow, no matter where they are based. "We want to make sure we use each cleaning agent in the right place, use the right wipes in the right place," said Sanders, whom United hired last year as general manager for cabin appearance. "The last thing we want is for someone to wipe the (lavatories), then use the same wipe on tray tables." The main reason why United's planes lagged other carriers was because they were cleaned far less frequently than the industry standard, a practice the nation's third-largest carrier adopted during its bankruptcy, when it was conserving cash to survive. United's aircraft typically would languish for six months between "heavy" cleans, and sometimes as long as every 18 months. That is an intensive scrubbing of the passenger cabin, done every 30 days at many carriers, in which every surface is swabbed, carpet shampooed, nooks and crannies scoured and seat cushion removed and searched for stains. Now, the intensive cleans are done every 30 days for the smaller United jets that fly within the U.S. and every 15 days for the wide-body aircraft that cross the Atlantic and Pacific Oceans, enduring wear and tear during the long flights that can cause planes to become rundown more quickly. All 409 of United's planes have undergone deep cleaning since the fall, and the aircraft are starting to shed the patina of grime that built up over years of neglect. The results were visible on a Boeing 747 jumbo jet as a cleaning crew scoured it at O'Hare following the flight from Hong Kong in mid-January. Plastic armrests that had taken on an olive-colored sheen from oil rubbed off of passengers' arms and hands over decades of use are starting to return to the original blue-gray tone they bore when they arrived from the factory. "A clean armrest after five or six (heavy clean) cycles will look brand new," Sanders said. "You just have to get the grime off."